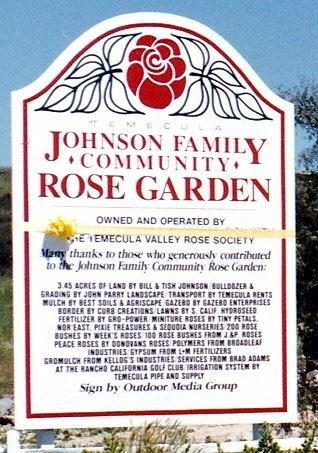 #2: "I DO Promise You a Rose Garden"
#4: TVRS Hosts a Visit to "An English Country Rose Garden"
and I founded the Temecula Valley Rose Society in March of 1990. Most people in the area are not even aware that this society exists, let alone that we have a spectacular public access rose garden, aptly named Rose Haven. My purpose in writing this is to tell this history of how it all got started. I moved to Temecula in 1988, and, quite honestly, I was just busy for the first two years raising my boy-girl twins, Jonathan and Katie Rose. They were two years old when we moved into Lake Village. They reached a wonderful "age of reason" by the time they were four. Before moving to Temecula, my husband, Fred, and I had lived in San Diego. We were proud members of the San Diego Rose Society. We had even attended our first rose show and won numerous ribbons for our miniature roses and even one trophy for "Best Novice", for a lovely apricot rose called Brandy. My father had a green thumb and we always planted roses at every home we lived in (all 30 of them) in the years when I was growing up; and he passed on that love of roses to me and that green thumb, too. Our first home in San Diego had about 75 rose bushes and our home here in Temecula back in those days had about 100 roses! Sadly, not anymore. One day, my twins and I were out in the front yard, finishing up the pruning for February. Yes, they actually had their own blunt-tipped Corona clippers. A local photographer for the newspaper called the Californian (Steve Thornton) asked if he could snap our picture. He then asked if the paper could give out my phone number, just in case anyone had any questions; so I said "sure" as long as it wasn't actually printed in the paper, I was fine with giving out my phone number. Well, the local Garden Club did call and they asked me to come and speak at their March meeting. They even provided me with a few potted roses; so that I could demonstrate how to prune roses. As I was giving my speech, I asked how "I" could appear to them to be an expert on roses? Wasn't there a local Rose society? When they said no, it only took me a short while to realize that it was time for Temecula to have its own Rose Society. The Californian was very helpful in me getting the Rose Society started. 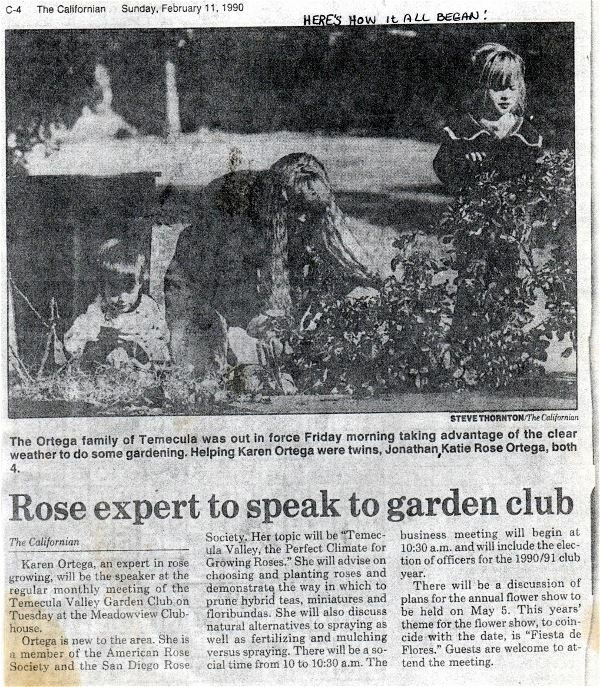 I used their local news notes to write a short message inviting anyone who loved roses to attend a meeting at the Lake Village clubhouse on May 13, 1990. I asked them to please bring a baked good and that I would provide an "elegant" tea on my finest Rose China. So, my twins and a very helpful little girl from next-door, Jessica, helped me measure and bake a cake and some cookies; then we used our little red wagon to transport everything over to the clubhouse. Thirteen wonderful Charter Members showed up. Our current co-President Rebecca Weersing, became my first Vice President, Virginia Boos took notes the whole time, so we elected her Secretary, and the great Edie O'Hair finally became known as the first, greatest rosarian in Temecula. We now have many Consulting Rosarians in the TVRS. I just wish I could find the notes and the names from that first meeting, so I could acknowledge all thirteen of our charter members. 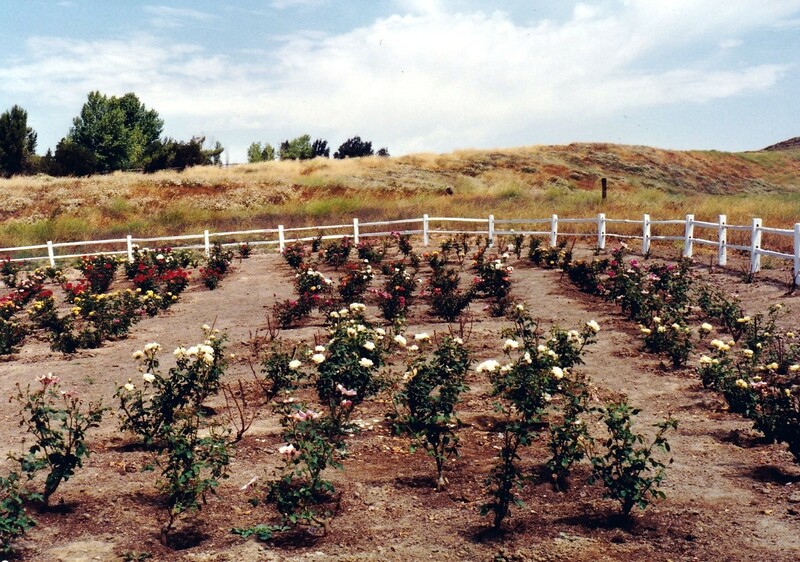 Well, we learned about the beginning of the Temecula Valley Rose Society, and now we will move on to learn how it grew and how we obtained the land for a public access rose garden. As to how quickly the Rose Society grew, 13 people attended the first meeting on May 13, 1990. Within one year, we had over 100 members. One of the reasons we grew so fast is we got a lot of newspaper exposure. 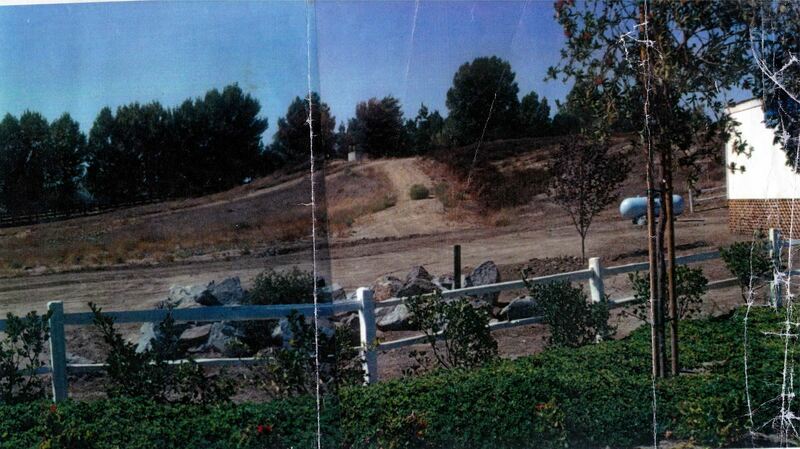 There used to be a business on the corner of Rancho California Road and Ynez called Coldwell Banker Real Estate. 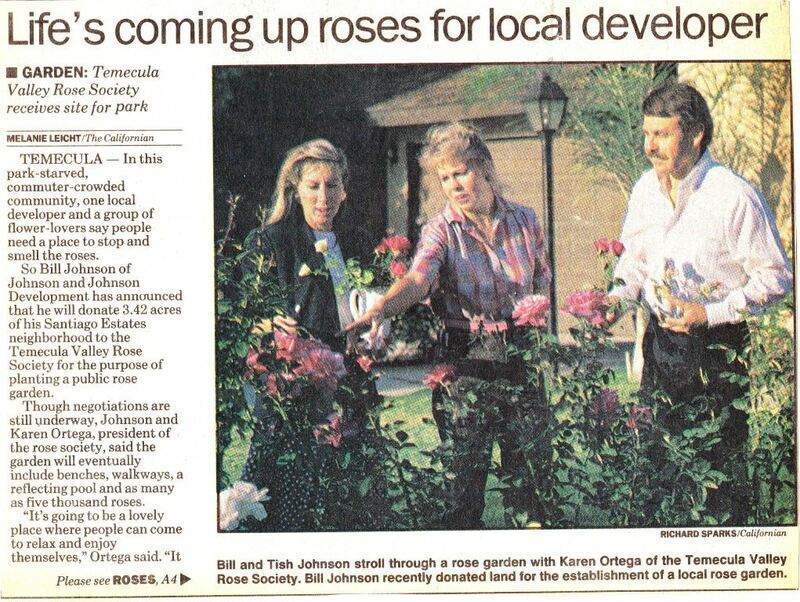 The owner of that business, Bill Johnson, and his wife Tish loved roses as much as I do. 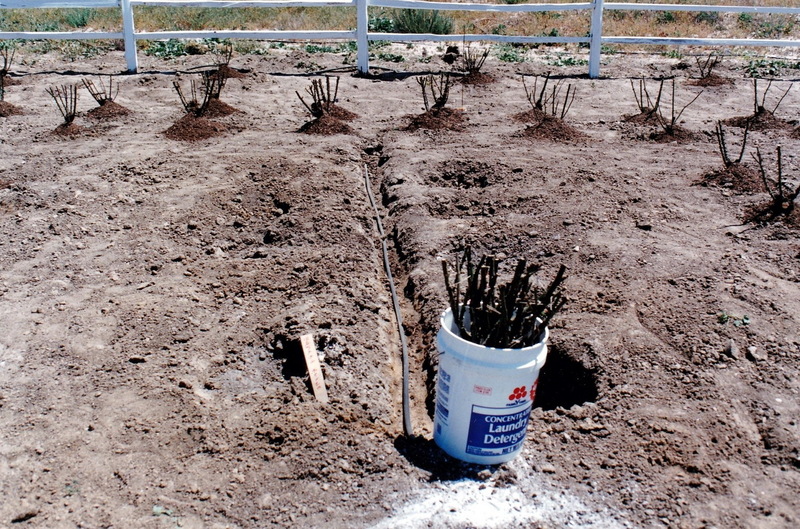 In the course of selling homes, the Johnsons believed in giving every new homeowner a bare root rose. They wanted to make Temecula like a certain town in Switzerland that is known and famous around the world for its roses. I'm not quite sure how I became known to the Johnsons; (unless they just happened to be reading about the newly created Rose Society), assuming that, they contacted me through the newspaper and it turned out that we shared a lot of the same goals. We wanted the rose to be the symbol for the new City of Temecula; So Virginia Boos and I got dressed up in our fanciest rose "suits" and we attended a city council meeting where we presented them with red roses in pots and asked them to legally adopt the rose as our new city's official flower. And they did! Both the Johnsons and the TVRS wanted roses planted in the median strips, so I've got pictures of that to show you, and "I" desperately wanted a public rose garden. TVRS itself was a little torn about the idea of us having to maintain our own gardens as well as do all that volunteer work on a possible public rose garden! But my original 13 plus many new members were 100% behind the idea. Now the Johnsons had already given us permission and a sign with their family name on it to place on a piece of property that was appropriate for building a Rose garden! Houses could never be built there, as a small earthquake fault (or two) runs through the property. Also, dead center on the level ground, there is a Metropolitan Water District access and road. Now I'm not going to say that things remained as "rosy" with the Johnson's forever, as they were in the beginning. But their original intentions were honored by the Rose Society, and we faithfully planted the garden, maintained it over the years through too much rain and too much draught. And in recent years the state of California has granted Rose Haven clear deed of ownership to the non-profit organization that is TVRS. That was a proud day and a huge success. Mostly it took hard-working, energetic people with strong backs who showed up on a regular basis to maintain our drip system, cut deadheads, prune roses in late winter, and plant more roses. Then it took enterprising people like Roy and Virginia Boos, who brought down their backhoe to clear the native shrubbery, and level and grade the land. I do believe it was Roy who built our first arbor at the entrance to Rose Haven. Can you name the five people standing in front of our first arbor? There have been many more arbors added since, but one of the most unusual is made up of intertwined Roses and leaves, in wrought iron, made by David Granlund, and a tiny plaque says Donated by David and Margaret Granlund. It's a double-wide arch, and it absolutely "Wows" the eye. And it's a small world. 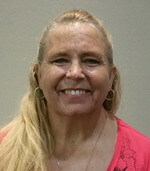 I met Margaret Granlund as one of my Tai Chi students, after I'd been away from TVRS for many years. She was always wearing this gorgeous silver rose necklace, and I said that I admired roses very much, and she said, of course you do, you are the founder of TVRS! If I had met Margaret within the first two years, I'm ashamed to say I hadn't remembered her. This one photo is missing from my phone. One thing I do remember is a drought that second year, where I had this dream of us somehow building a lovely rose-painted water tank to capture our rare rainwater, up at the top of the garden, with emergency drip lines that would save our garden from burst water lines down on the street below. Yet we weathered just such an occurrence, and the roses were well established and hardy enough to survive. But I can still picture that water tower in my dreams! Do you know who really saved us from that first drought, and no doubt many others? The subtle presence, the hardest working and most loyal and greatest friend of TVRS? And Rebecca Weersing, who paid our water bills, etc. when the going got tough. So heartfelt thanks to Rebecca. So, during the first two years, we continued to beg roses from Tom at Week's Roses in Bakersfield. But, as Virginia Boos recently pointed out to me, many that we received were not top quality, or #2 roses, that by now should be replaced. Perhaps it's time I started calling whomever is in charge there now, 24 years later, and once I show them a current picture of say, last Mother's Day spectacular bloom, they'll ship us for free, again, top quality #1 roses. Because that's what a rose garden of our caliber deserves. Photos left: 4 year old twins playing on "mulch hill" in January, 1991. 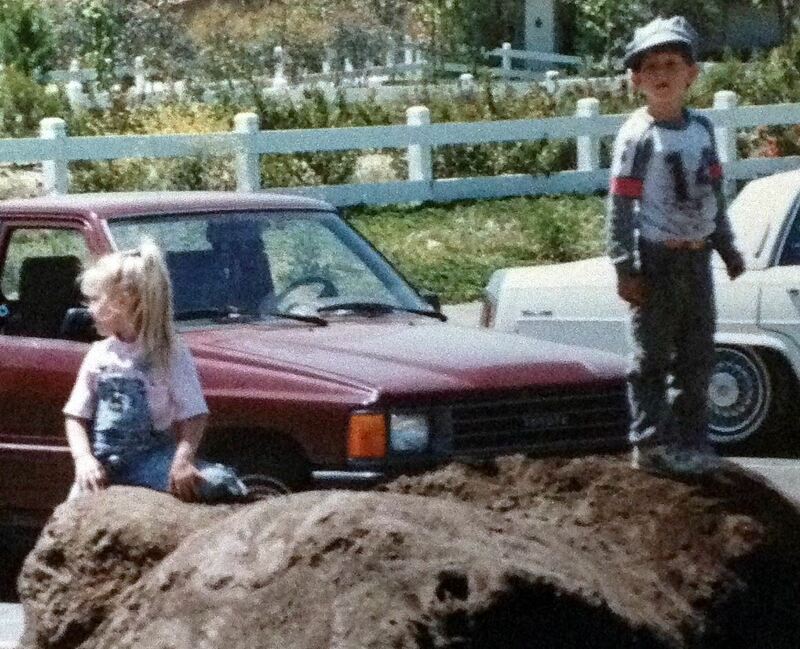 #2: 29 year old twins taking their Mom to the rose garden we all built so long ago, with A LOT of help from our friends. My son Jonny was totally blown away by the scope, growth, size, and sheer beauty of our unique rose garden, that had started out as bare ground 25 years earlier. Jonathan and his wife Alyssa belong to the Huntington Rose Gardens and he says their rose garden can't hold a candle to ours. The luscious purple growth leading up gorgeous terraced rock steps to a weathered wood square arbor/gazebo that is like something from "A Secret Garden", it invites mystery. Our real life, all white, octagonal gazebo, the one that got away from our original list of items donated. I'm totally happy now. 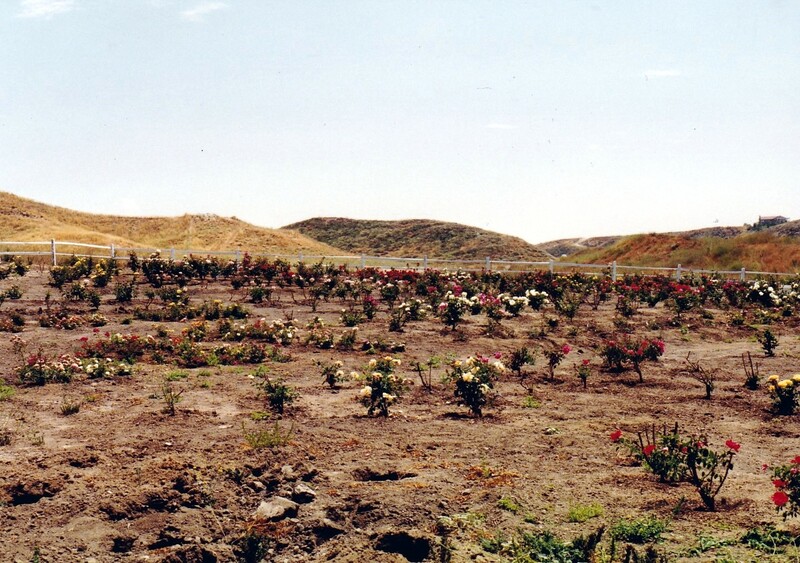 The never-quite-completed Rose Haven is all that I dreamed of and more. The water Lily Pond, in full and glorious bloom, surrounded by wooden benches. Dragonflies galore. Go see our rose garden. Take your pruning equipment: hand saws, loppers, large and small, and hand-held clippers. Express. Frank Brines recently gave a wonderful talk on how to prune roses. Do it his way or do it like Roy Boos (quite radical). I look at the bottom, picture my urn, and have my strong young lawn man wield the lopper. But I only have seven roses to prune. Two are patio size Icebergs. Have fun. 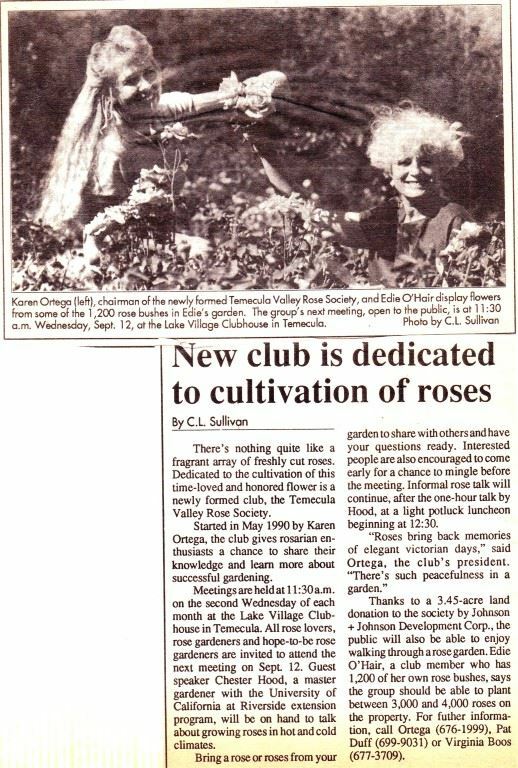 Not many new organizations find buried treasure in the hills west of their new city, but the Temecula Valley Rose Society did! We found a new member — Edie O'Hair — in August, 1990, who just happened to have a garden the likes of which very few have ever seen. Edie O'Hair's garden is a crown jewel, sparkling with gems of many colors. As a board member and chair of The Temecula Valley Rose Society's Ways and Means Committee, Edie brought up our need to hold a fund-raiser to cover the costs we had incurred as a first year organization. She offered her garden as the location for the event. To stage a fund-raising event, a press coordinator and three or four helpers are needed to tackle all the media angles. Our press secretary, Ed Renner, wrote a fantastic one page press release which we copied and sent out along with pictures and an invitation to come out and photograph the event to newspaper gardening editors, local glossy magazines, and T.V. Announcers. Public relations Committee member, Virginia Boos, condensed the information into short, readable notes and sent them to at least 20 radio stations. She also wrote to Huell Houser. But he didn't come. The radio stations read these aloud for the six weeks prior to the event during their public service announcements. In addition to contacting all the Calendar sections of newspapers, within driving distance of Temecula, we wrote to the editors of every Southern California rose society and garden club. We notified them in time to make it into their newsletters two months in advance of the event. They turned out in in force to come see Edie's spectacular garden. Get to know your gardening editors. It really pays off! Board member and editor, Rebecca Weersing, knew we'd need a great descriptive program to pass out at the fund-raiser. Edie gave her a special tour of the garden, with Rebecca taking notes of Edie's detailed description of plantings and hidden "finds" like certain statues. Rebecca then created a collector's item hot pink program of what to look for in the garden, including a hunt for hidden treasures to make it fun for children who attended. Claudia Leach, a talented and artistic rose society member, designed a stunning calligraphy poster for us. After reducing it to a copiable 11 x 17 size, we printed hundreds of posters. Our volunteers placed these in store windows, libraries, and Chambers of Commerce all over Southern California. We further reduced the poster size to 8+1/2 x 11, printing a map on the back. We sent this out to everyone we could think of in So. California, and this same flyer graced the cover of our delightful program. Our great members volunteered to put our personal home phone numbers on our posters and in press releases so we could answer questions, give directions, and sell pre-event tickets until our voices gave out. Richard Hoffman, a local sign maker, made up a dozen directional signs to help lead out-of-towners and even locals to Edie's hidden De Luz paradise. Freeway exits were covered, along with cross-streets. Next year: helium balloons will help call attention to our signs. Prepare for every eventuality! We had a first aid station donated by Sharp Hospital. Our local fire department paramedics were on hand as much of the day as they were free. Price Security guarded our hilly entrance and patrolled our concessions. The Sheriff's Dept. was really fantastic, not only covering the street and parking, as well as accompanying our chief treasury officer down to the bank every two hours throughout the day. "Watch Your Step" signs were placed throughout the garden, along with other informational signs donated to us (again) by our local sign man, Richard Hoffman. Volunteers worked six to eight weeks prior to the event, cutting deadheads and sprucing up the garden; but nobody worked harder than Edie and her husband, Mel. 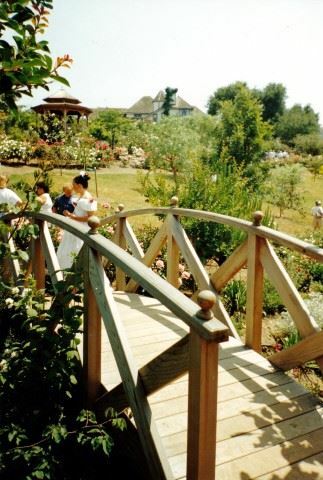 They had their lovely gazebo and wooden bridge, as well as multiple extra plantings and pathways put in way ahead of their five-year plan, so the garden would be perfect. I'm also quite sure that Edie singlehandedly passed out more posters and fliers than any other rose society member. She would also work from dawn until full dark adding annuals and perennials to further enhance the beauty of her garden (and only a few of us knew she was also planning her daughter's wedding at the same time). What really made the day a huge success was the combination of efforts of the 30 volunteers (about 30% of our membership). We had deadheading parties on certain workdays. We would start as early as 8:30 or 9:30 A.M., work until noon, and then lunch would be "catered" poolside by different rose members who liked to cook and bake pastries. Those were delightful parties. We definitely got more work done on party-free days, but looking forward to those parties kept volunteers coming back often. I remember one day, just showing up by myself to work in the garden. I always liked working on rainy days. Then the thunder and lightning started, and Edie and I took refuge in the wooden gazebo. She said "Just stay here, Dearest, and I'll bring us something to eat." When the lightning had moved on, down came Edie from her lovely French Tudor home, balancing a pure silver tea tray, loaded with all the goodies one would expect to eat and drink during High Tea in England. During the last days just prior to the event, ALL of our volunteers turned out in force to do weeding, raking, and deadheading. Edie's weeks of her special program of spraying and feeding began to really pay off. Perfect weather the day of the event topped off a perfect setting for a garden with hardly a leaf out of place. 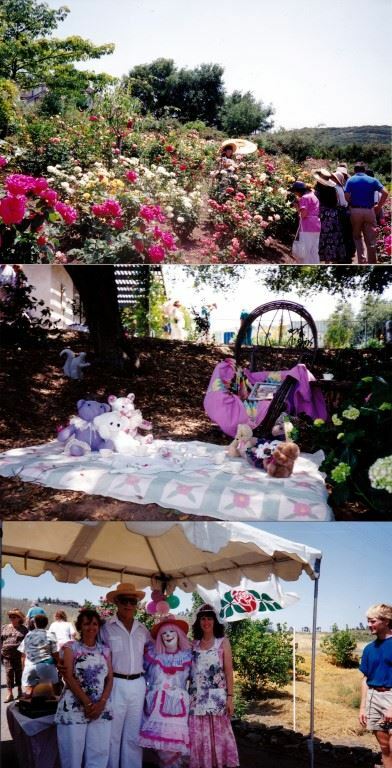 We all wore rose print dresses, very popular in the early '90's, large, rose decorated sun hats, and comfortable flats. The public loved the whole dress code and the idea of placing educated docents throughout the garden to answer questions. Our gentlemen docents wore their matching corduroy hats and we all wore our name tags. We sold small bouquets of mostly miniature roses in small rose-paper wrapped milk cartons and soup cans and also nosegays pulled through sweet lace paper doilies. At the same booth we also sold potted miniature roses and matted rose prints. We had a raffle booth featuring elegant donated prizes, a small white elephant sale, and, for the children, of course, pony rides, a clown and a separate face painting booth; not to mention the "Find 6 Hidden Treasures of the Garden" printed on the back of the program. Food wise, the following local businesses had booths: Food for Life (muffins), The Sweet Bean (gourmet coffees and pastries in the morning and ice cream in the afternoon), a huge success! Edie wanted everything as elegant as a classy wedding, so the tables, chairs, pink table clothes and tents were all of the best quality. Guests who had pre-purchased their tickets with a reasonably priced meal had the option of sitting at these tables and eating the best food from the elegant Park Cafe Catering Co., while others could choose Crazy J's Pizza Co. or the very fun and popular local Hot Dog Vendor! Two of the most popular concessions were the Herban Garden and Baily Winery. Every concession made donations to our society. If the picture is not yet complete in your mind, then just imagine the classy chamber music from the Festival Quartet; wafting down to you from the front porch of Edie's French Tudor-style home; imagine diners eating elegant catered meals. Remember those pink table clothes? Now picture the rose bouquet centerpieces. Now imagine yourself on the backyard pool patio, under the shade of climbing, fragrant Snowbird, listening to a classical guitarist. Everywhere you look, there are roses planted right along with knee high lavender, iris and every other blooming plant you can imagine. Altogether, 1,500 to 1,800 people attended our event. The tickets were so incredibly reasonable that any family, of any means, could afford to attend. Our ticket price was only $4 for adults and $2 for children. After we added up our expenses, we knew we would have to charge more for admission in future fetes. Our first year was only a one day event. We knew next year, we'd have to make it last at least, two days, as well as raising prices to be a true financial success. However, we gained numerous new members and made lots of good friends in the community. A great time was had by all. We did a terrific job, but also learned so much. We repeated the Fetes for four years. We made new friends like Deb and Rob Mock of Houston, Texas. 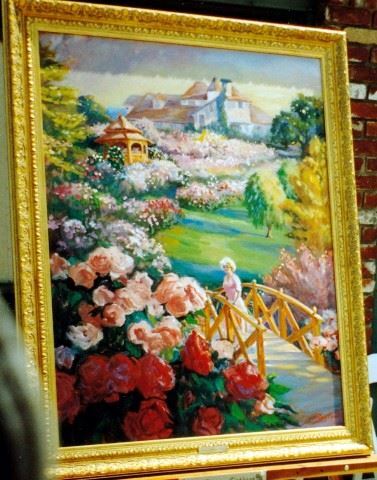 They planned their whole vacation around a visit to "An English Country Rose Garden." I remember standing all alone at the top of Edie's driveway, watching as she and Mel drove down the hill to get some dinner in town. It was so peaceful and quiet after the hectic day, weeks, and months of hard work. I felt as if we had truly accomplished something great together. Now and then, I feel nostalgic about the energy and determination and dedication we all had to our cause. 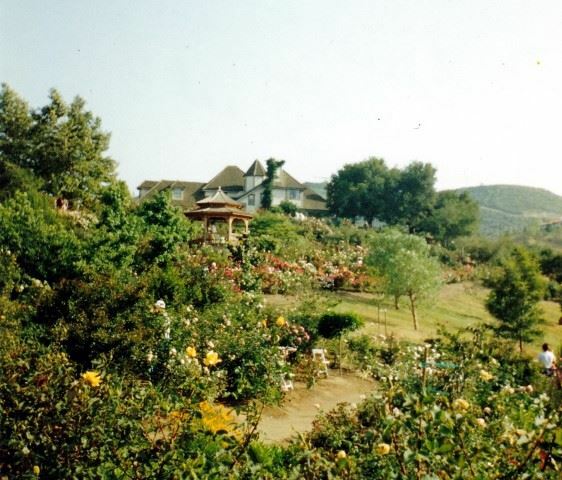 Twenty-five years after founding the Rose Society, it remains a thriving, vibrant society, full of energetic people, dedicated to maintaining our glorious Rose Haven. Thank you ALL!